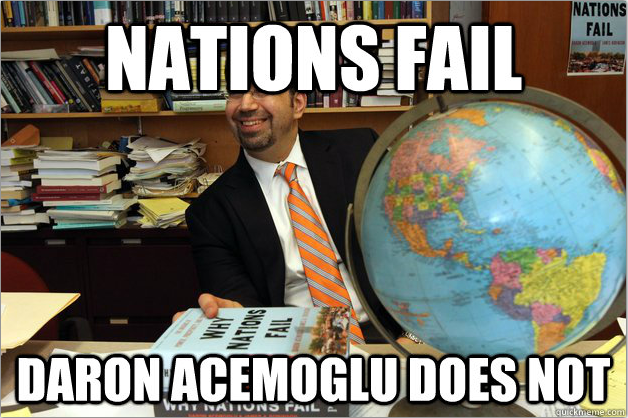 Daron Acemoglu is an MIT economist and co-author of the popular book: Why Nations Fail: The Origins of Power, Prosperity and Poverty. The book has been rightly celebrated as helping to enliven sterile debates within a highly mathematical economics profession about the “big questions” of social science, such as: how are politics and inequality connected to each other and to growth at the national level? Acemoglu and frequent co-author James Robinson (a political scientist now at Harvard) began a long line of published articles over 12 years ago, back in 2000. I’ll call the pair AceRob. Their initial articles used game theory to explain why nations do or do not democratize. Their major contribution from that year specifically examined the economic conditions under which elites would choose to extend the voting franchise to the working classes. In their model, the fruits of economic growth accrue unevenly in countries. Specifically, the rich utilize technology that assure them steadily rising shares of the total national income, while the poor accumulate little to nothing. This is a very unstable situation,with a constant threat of revolution. The elite have a choice to redistribute and maintain control, or democratize and accept the higher taxes that will come with that. Because the elites cannot credibly commit to redistribution in the future (i.e. their future incentives will not always line up with they say they will do), instability will continue, and a revolution where they lose everything might result. The elite are therefore better off over the long-term with democracy – which takes some but not all of their income away. Predicting transitions to democracy then becomes about having just the right amount of inequality. With too little inequality, revolutions aren’t credible and non-democracy can persist for a long time (i.e. post-land reform Korea under the Park dictatorship). With too much inequality, a revolution threat can come “before its time”: the elite in this situation will have enough money to transfer to the poor for a while, but not enough to hold threats off forever (as in Germany in the 1800s). The key then is having credible revolutionary movements at the right time: which is what Acemoglu and Robinson said occurred in the 1800s and early 1900s in England, France and Sweden. The authors maintain that their model explains franchise extension better than competing theories from other historians and political scientists. One competing theory is that the rich extended the franchise because of the influence of enlightenment views. However, these ideas were available to all European nations as of the 18th century, yet the franchise didn’t begin to be expanded until the 19th and 20th. Another theory argues that enfranchisement happened because the Conservatives then in power in countries like the UK wanted to curry favor with potential working class voters. AceRob don’t find this convincing, citing quotations that the Conservatives knew they could not get this vote. Finally, they discard a thesis associated with Barrington Moore – that it was the influence of a strong middle class that allowed for democratization – by returning to some quotes by middle class leaders that they saw the working class as dangerously redistributive (away from them), and noting that middle classes in Sweden and elsewhere were party members of the more elite parties. The AceRob analysis of democratization is mathematically elegant but sociologically blunt. It shows the surprising meeting point where Marx and neoclassical oversimplications meet – a notion I will return to in future posts. It assumes that the interests of all parties are material and capable of being compared in financial terms. AceRob assumes that classes are unified, and know (and act) in their own interest here and in the future. Of course, information uncertainty and asymmetry and lack of class cohesion are the story of the Western World. AceRob would probably argue that, if things get sufficiently materially bad, incentives will overcome “false consciousness” (i.e. lack of alignment between values and objective class interests). But, this can have a post-hoc quality – if social change happens, it was because the incentives were sufficiently strong; if not, not. In retrospect, we can always explain things this way, but it becomes harder to predict without a theory of how values and incentives are reconciled. They also have a highly problematic vision of the state. In elite control, all state power accrues to the rich. In revolution, to the (relatively unproductive) poor. In democracy, governments work in the interest of the poor median voter through efficient taxation and transfers. But history (especially successful developmental history) is full of relatively autonomous governments that pursue interests that go beyond the interests of the most economically dominant groups. That said,their model has an interesting number of implications. For instance, even democracies can be unstable if inequality is so high that they don’t serve the interests of the poor. In this case, a winner-takes all incentive develops, whereby the rich fear higher taxes in the future, so engage in tax avoidance (in the model, through shifting from market to home production). If this goes on to far, the government is unable to function. Sound familiar to our current situation?